We celebrated my son's 2nd birthday yesterday. Since we were having the party at our house and only family was invited, I knew it would be easier to make the party "green-ish". I knew that I would not be able to avoid the typical birthday cake. We were browsing Publix.com looking for a cake for my daughter's birthday cake and my son saw the one above and freaked out. He has a slight obsession with trucks. So I did not even try to change that aspect of the party. 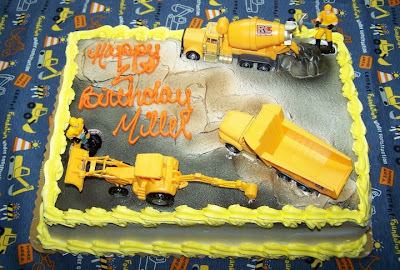 Here are a few of the things that we did to make our birthday party a little greener. I bought some fabric for a tablecloth, which cost me $8.00. I plan to reuse the fabric to make a pillow case and maybe something else for my son. I could also sew gift bags with the leftover fabric. We used biodegradeable and compostable paper plates. I had a stash of plastic forks and napkins from previous parties that we used. We dug out these really cool glasses that we got as a wedding gift as well as my grandma's wine glasses, instead of using plastic ones. I tried to keep the food fairly healthy. We served Cottage Cheese Egg Muffins, fruit with a yogurt dip, apples and bananas with a chocolate peanut butter dip, and ham biscuits. I only had to do 2 party favor bags so that made things a little less complicated. I purchased 2 felt bags that had a dump truck on the front. I filled each bag with a matchbox truck, bubbles, and a package of fruit snacks. Overall the party was a success and I feel pretty good about it. My daugther's party will be a different story, but that is for another post.